I was up early on day 2 and stood for a moment in the motel doorway, contemplating the Road King as though it were some postmodernist sculpture in the sunrise. Its gleaming chrome “big twin” engine, pipes, polished black-on-black fenders, beach bars and seven-inch headlight is nirvana in terms of form and function. I suspect the low grade headache has more to do with the tequila shots from the El Aguila Real restaurant the previous night than the crappy pillow. It was time for some caffeine. The rest of the crew was stirring and we headed across the street to the Tall Town Café & Bakery for some melt-n-your-mouth handmade cinnamon rolls. Even from the outside you can tell this ‘Ol School bakery means business and the eggs with home-made biscuits and gravy were perfect for the short 250 mile ride into Reno. After breakfast we brought the eight bikes to life in the motel parking lot and the neighbors likely wondered when was the quiet possession of their homes revoked? The sound makes your heart beat a little faster and we shake, rattled and rolled down the US 395 trail. 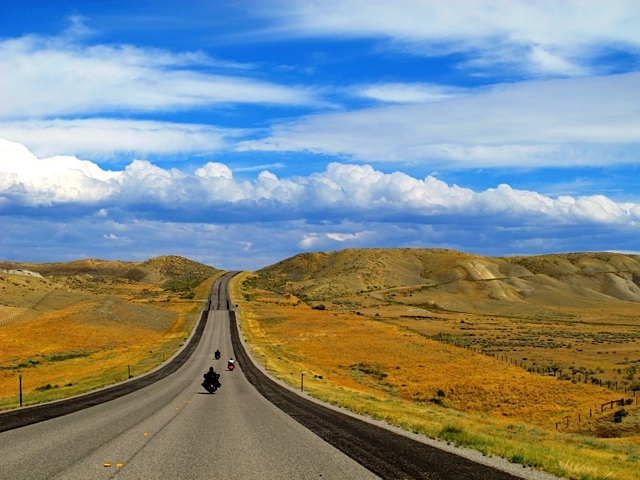 The road encourages a relaxed pace and many of the trappings of modern travel are just not on this road. Like the Doobie Brothers song “Clear as the Driven Snow“… “I keep rolling, and rolling, and I can’t stop, and I can’t stop…” there are no big box stores, no chain motels, no fast food chain restaurants and a couple hand painted billboards. 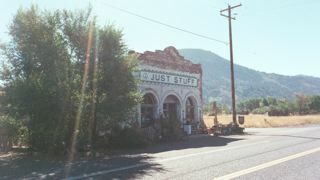 In fact at the Oregon – California border in New Pine Creek there is a shop called “Just Stuff“. I’ve never seen a customer parked there in all my years riding to Reno, but it’s still there! And near by the Goose Lake State Park is a large shallow lake that straddles the state line area and it’s so remote reservations are not necessary. We cruised thru Alturas, Likely, Ravendale and Litchfield. There is a running joke in this part of the country that the GNP is your choice of rocks, junipers, or sagebrush. Not much happening in the high desert, but I did learn that the WNBA basketball player Kayte Christensen attended elementary school in Likely. How unlikely! At Standish we filled up and chatted a bit with some High Desert State Prison guards making a shift change at the high-security, lethal electrified perimeter fence prison. 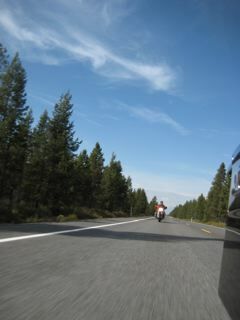 We skirted Honey Lake, avoid speeding tickets and rolled into Reno by mid-afternoon. 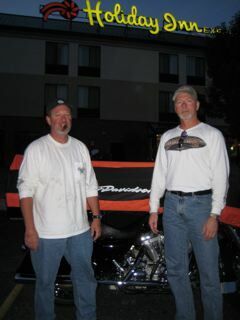 The crew unloaded and enjoyed all that Reno and Street Vibrations could offer up in the form of some refreshments. A couple of the “sig others” arrived in town and we had an awesome dinner in a local Italian joint called La Strada. 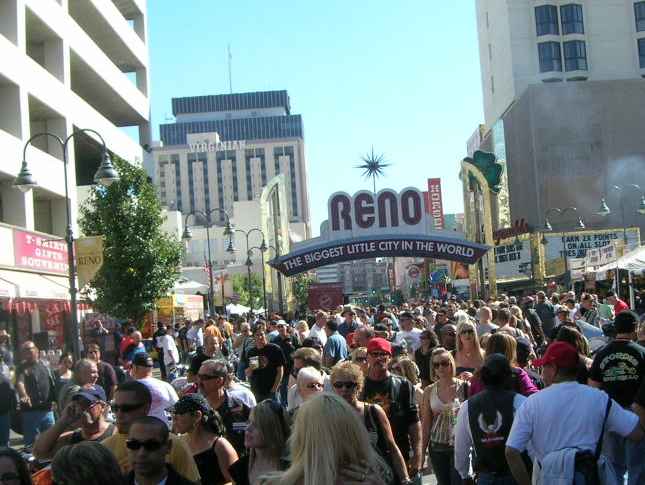 Next up is the Virginia City, Kit-Kat and Carson City tours. 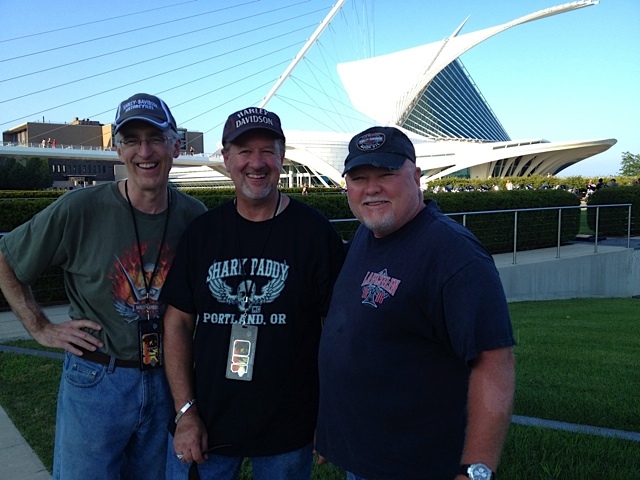 Read more about the Street Vibrations trip at Day 1, Day 2, Day 3, Day 4 and Day 5. Seven a.m. Wednesday (September 24th) morning. With the taste of coffee still fresh in my mouth, I finish suiting up. Tucking the t-shirt into the jeans under leather chaps, pulling the black-leather jacket over an old 2002 long sleeve t-shirt with a Street V logo on the front, I quietly open the garage. Outside, the autumn air is cool, but no rain like the forecast predicted! Sure it’s cloudy, but the moisture has yet to arrive so, the hard bags will hold the rain gear a while longer. Mounting the bike, I hit the starter button, and that Harley rumble fills the neighborhood. Without a hesitation, I kick it into gear and I’m off, heading for the open road,….then it dawn’s on me that I forgot to stop at the bank yesterday to get cash for the trip. I’m not off! A quick ATM stop and now I’m really off…leaving the “burbs” behind. Out on I-5, the white reflectors rush past at a solid 55 mph, and I feel the tensions of the work week slip away. The kiss-ups, backslapping and glad-handing, telephone yelling, busted deals, office politics, near misses, petty squabbles, seemingly life-and-death decisions, employee theatrics…all gone, blown away by the wind in my face and the moment. Lakeview is today’s destination and I’m in “big twin” heaven, easy riding, and it’s all mine: the machine, the highway, the distant rolling hills. 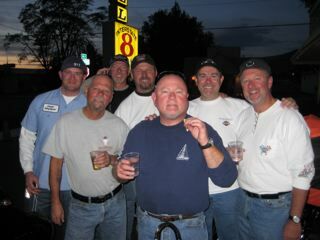 I met the eight member posse at the Troutdale Flying J and we headed east on I-84. My initial plan of following the ‘shortest-distant-between-two-points’ theory didn’t work out because rain moved up the valley and a decision to avoid wet riding meant getting to the east side of Mt. Hood as quickly as possible. 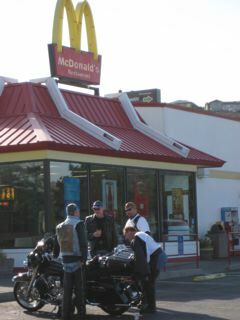 At the Dalles we stopped for gas and a “biker biscuit” and then rode south on US 197 – re; the Dalles California Highway. We crested the Tygh Grade Summit and then proceeded through Dufur. About a half-hour outside of Maupin the air became brown and visible due to forest fires off in the west. We dropped down to about 900 feet to the Deschutes River at Maupin in a dramatic winding river crossing and then climbed the Criterion Summit at over 3,300 feet. We intersected with US 97 at Shaniko Junction and proceeded to Bend for a lunch stop with the “Starz“. 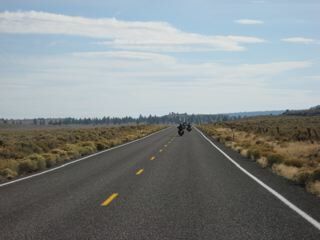 We intersected with Oregon Route 31 south of La Pine and headed east. 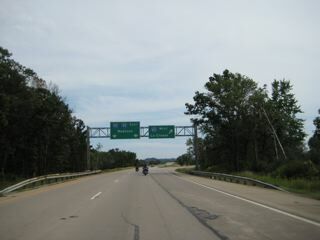 The highway is a 2-lane, rural road for its entire length. The thrill of leaning into a corner and twisting the throttle out–straightening up the bike until you lean back upright and roll into the straightaway–is as much fun now as it was on any rickety 1970s two-stroke with balding knobby tires back in the day. 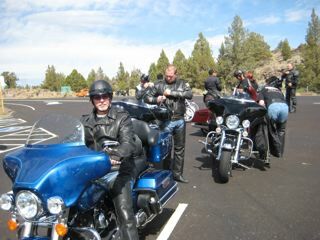 OR 31 is part of the Outback Scenic Byway and goes between La Pine and just past Lakeview at the California border. 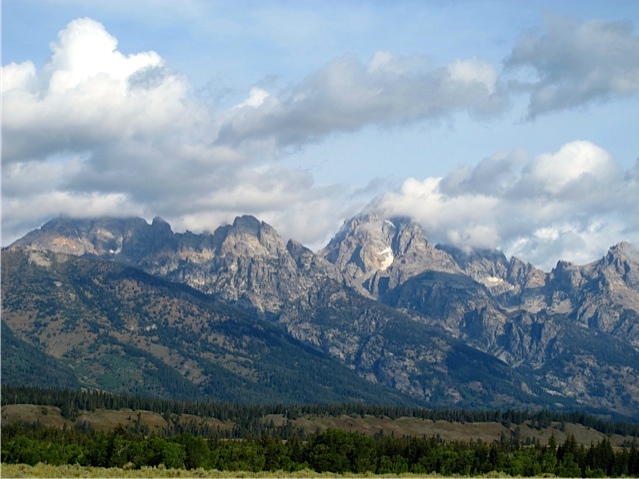 It passes multiple natural attractions like Fort Rock State Park, Hole-in-the-Ground and Summer Lake. This ~150 mile route starts in the Deschutes National Forest, through stands of lodgepole and ponderosa and we got to experience the beauty of the rural country and the remains of volcanic activity. 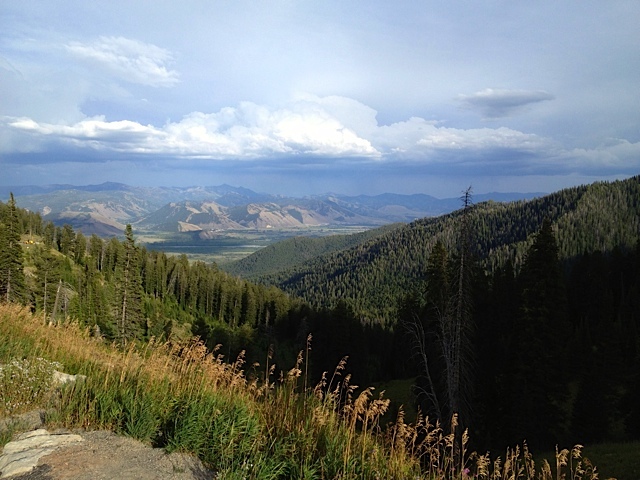 It’s a landscape of marsh, mountain, rim rock and sage-scented air. We arrived at the Interstate 8 motel in Lakeview with time to watch the sunset and wipe the windshield free of our bug collection. We ate dinner at the El Aguila Real Mexican food restaurant and enjoyed post dinner refreshments at the Eagles Nest Lounge…a local “elk-hunter” bar. 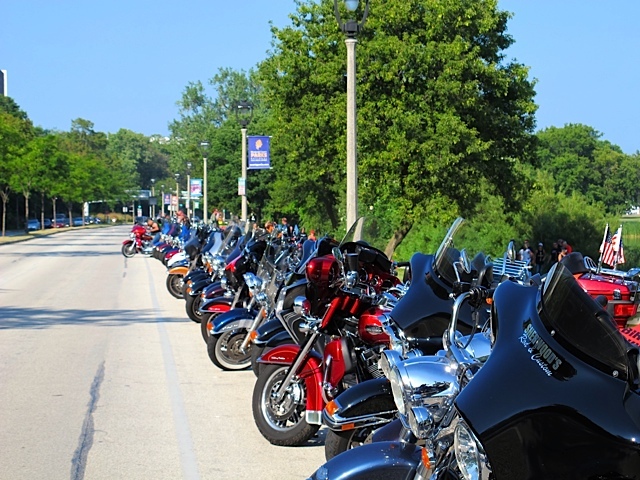 Read more about the Street Vibrations trip at Day 2, Day 3, Day 4 and Day 5. The Club H.O.G. 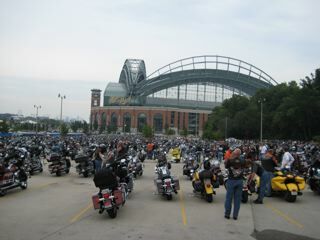 25th celebration started Thursday, August 28th at Miller Park Stadium (home of the Milwaukee Brewers). Free for H.O.G. members the day-long celebration was prior to the start of the 105th Anniversary event. 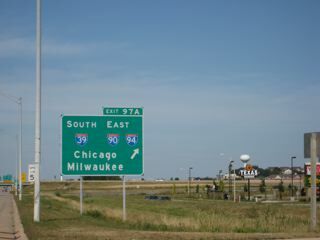 We departed about 9:30am to get a jump on the day and drove the twenty minutes which came to an abrupt stop on the Interstate near the stadium exit. Surprise, there’s a huge traffic jam! Not knowing exactly what or where we were headed…the delay due to poor traffic control wasn’t obvious until after we got parked in the stadium lot. Once parked, we waited in a long line that took approx 35 minutes to get into the refreshments and concert area. Within an hour it became obvious that it was going to be a “sardine packed” day and the heat/humidity was increasing. The State Police lined I-94 and started controlling access to the exit having people go around the stadium and come in from an alternative direction. I’ve never seen so many motorcycles let alone so many Harley’s. Incredible! While we were in line we made some new friends and shared stories of the open road. 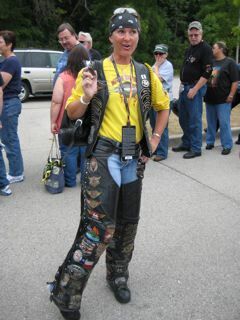 The camaraderie of standing in line meant we all got to chat with H.O.G. members from around the world. Many seemed surprised we rode out from the Northwest rather than trailer. 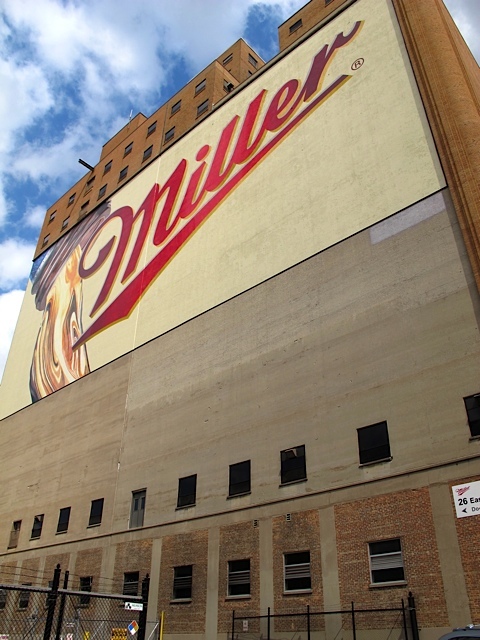 As the day progressed all you could hear was the low drone of exhaust and see a constant stream of motorcycles snaking their way into Miller Park. Wow, the place was packed! I’d be remiss not saying there was excitement building. Space presented some challenges, but people were laughing, hugging, joking, and having an overall good time. 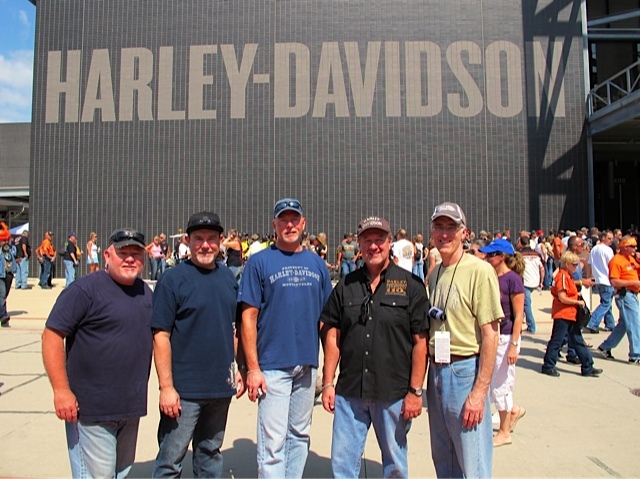 We let the DB Bryant Band rock us for a while with their cool sounds. 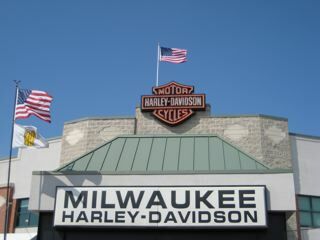 Our group wanted to experience some more of the culture that Milwaukee had to offer, so we left for awhile to enjoy some authentic Harley dealer activity in one of the historic neighborhoods and we dropped in on Hal’s (New Berlin). We did a drive by of manufacturing plant on Capitol Drive (Wauwatosa) where the powertrain operations are located. I was told that H.O.G. distributed 250,000 pins and ran out in under four hours. Wow! 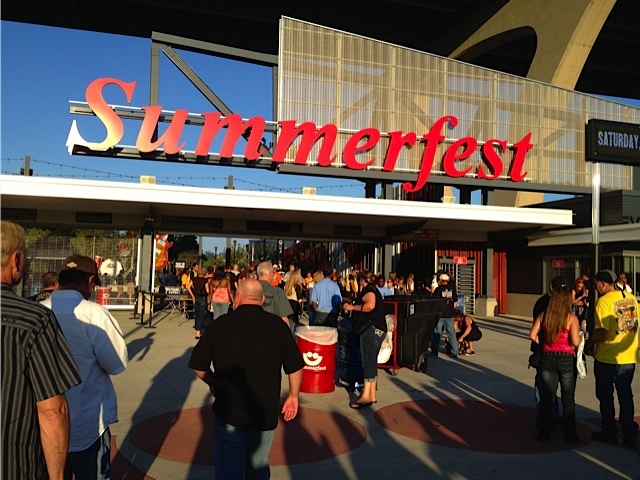 We headed back to the stadium as it was getting time for Kid Rock. First off we had to sit through introductions of Jim Ziemer (CEO), H.O.G. executives, MDA spoke person (Luke Christie) and Willie G along with his family. 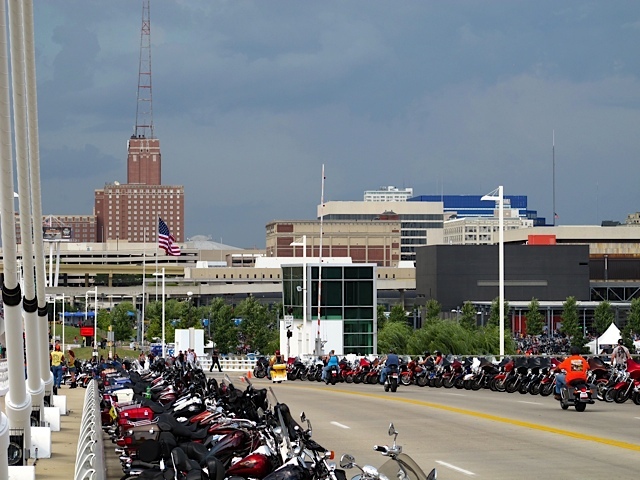 I’m not sure where they all were prior to the speech, but 3 of the 5 people from Harley-Davidson who spoke were nearly DRUNK…their words slurred and barely understandable. Willie G went off on some motorcycle story about Harley HYPHEN Davidson…reminding everyone that he had the last name in the motor company’s name….odd, very odd rant. 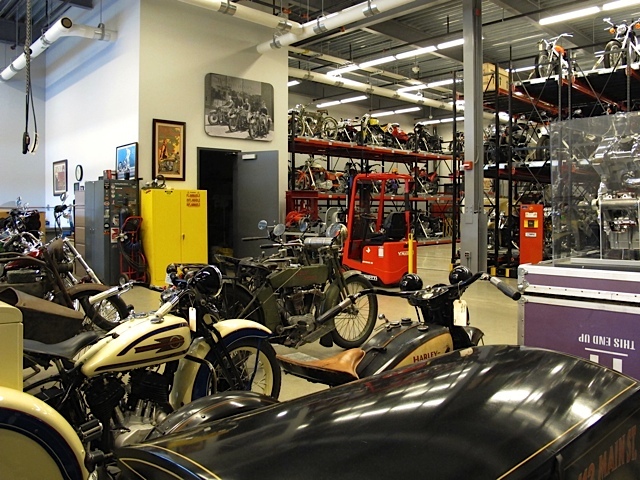 His son (Michael) did a nice job of interrupting the word slur rant of Willie G. and tried to make some sense of the family business and his passion for making the best motorcycles in the world. 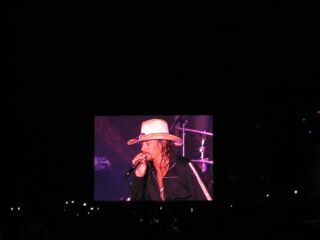 Back to Kid Rock and man did he rock the crowd. People lined the entrances excited to see this dude perform. The songs from his new CD (not on iTunes!) are dam good. “All Summer Long” is terrific, but the live version of “Half Your Age” is one of my favorites. The crowd was the biggest sea of people I’ve ever experienced at a concert standing at stage level. The folks at H.O.G. thought ahead to have the jumbo-tron viewing screens under the beer garden tent and in the food vendor areas. 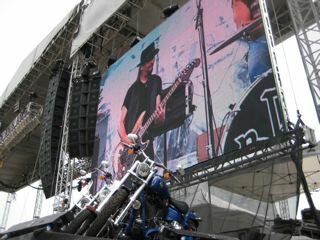 It definitely allowed more people to enjoy the headline act. Word is that Kid Rock is getting set to roll out his own beer and cigar brand. All told, I thought it was one great day packed with a whole lot of fun and it was a really cool place to be. Great job H.O.G.! Where Have All the Saddle Bags Gone? 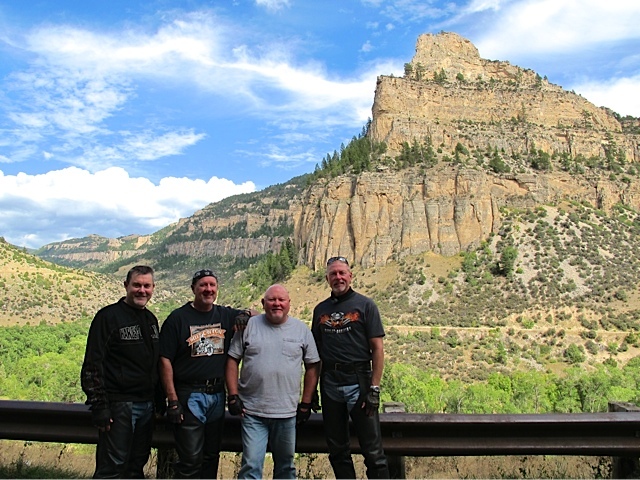 What turned out to be a post-Sturgis story telling and laugh adventure ended up being a birthday celebration for Eastwood, and a re-cap of the Reno-Street Vibrations ride…quite a milestone for the posse to reach this year and doing it on one of finest motorcycles on the planet! 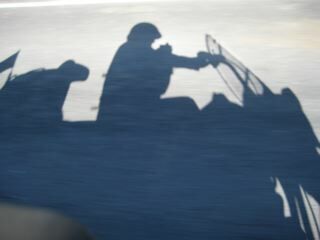 What better way to welcome a close of the Northwest riding season (at least without rain gear and winter gloves!) than to have a recap of the heat, the rain, the rides, the repairs, the pretty, the ugly, the FUN! 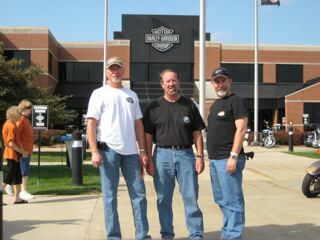 And speaking of birthday celebrations August 2008 is the 105th Harley Birthday party and 25th Anniversary of H.O.G. 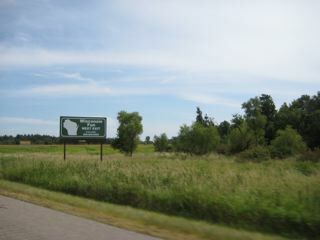 in WI. 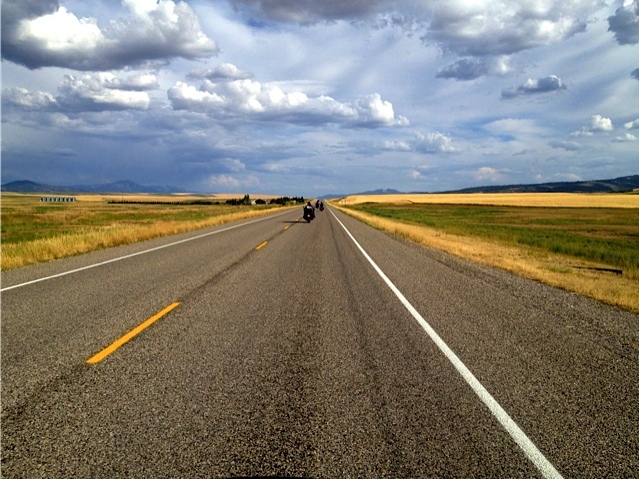 I’m thinking this could be a great adventure to add to my riding log book…. The first Harley Davidson motorcycle was created in 1903 with a single cylinder, three horsepower motor. 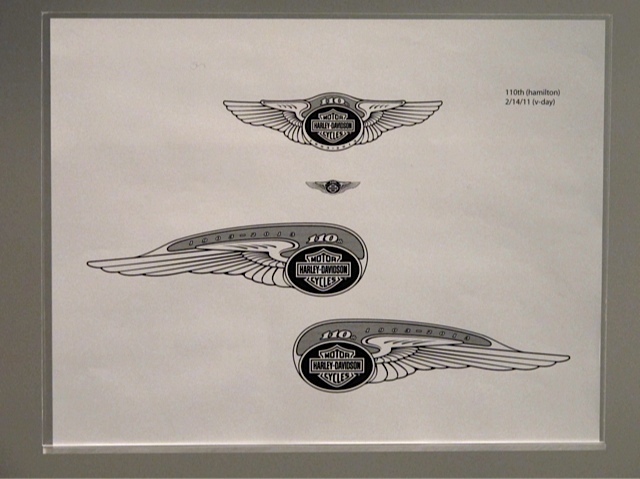 In 1906, Harley Davidson manufactured the first 50 motorcyles bearing their name. The V-twins that it a household name today came out about 1909. The “Choppers”, we love, were born and “Hogs” were named for the extra room used to transport racing pigs without switching to a larger vehicle. 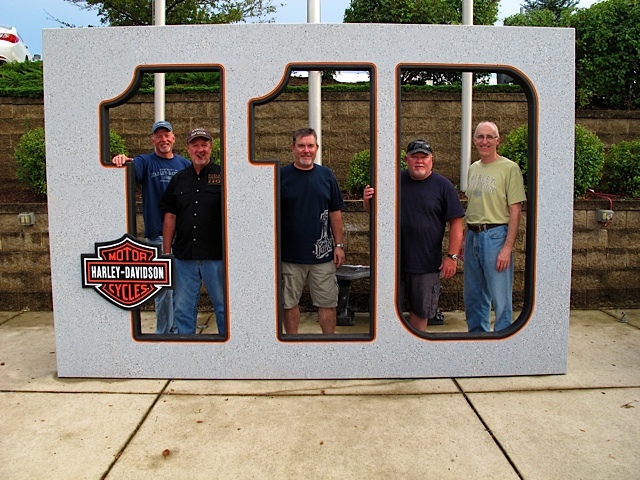 In 1983, H.O.G., The Harley Owners Group, formed its first chapter. Today more than 1,000 chapters are in existence and more than one million members. I’m looking forward to planning out the ’08 rides. 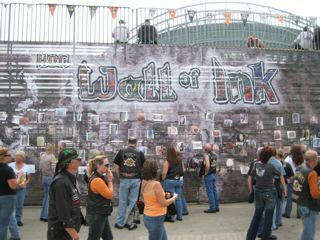 If you are the lucky owner of a Harley then you know what its like being a member of the family.